Why is your Mac—or your Mac’s Internet connection—running slow? Which programs are gobbling up RAM, hogging the CPU, or sucking up all your bandwidth? 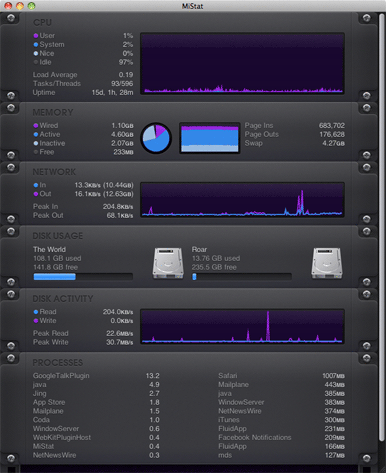 Bjango has long offered its iStat Menus utility for monitoring your Mac’s stats, but the company’s new MiStat (Mac App Store link) takes a more traditional app-based approach to keeping tabs on precisely what your machine is doing. MiStat’s interface consists of six connected charts. The utility tracks utilization across several areas: CPU, Memory, Network, Disk Usage, and Disk Activity, and also reports on the top proceses, both by load and by memory usage. For CPU, Network, and Disk Activity, MiStat displays live-updated line charts. The CPU chart also breaks down your Mac’s load average, its uptime, and the number of open tasks and threads. The Network chart monitors both inbound and outbound network traffic, and keeps track of your peak download and upload speeds, too. The Disk Activity chart monitors disk reads and writes, and tracks peaks for those two areas, too. For Memory, MiStat relies on pie and bar charts. Disk Usage shows bar charts for space used and available on your machine’s hard drives. MiStat’s data is useful and interesting, and the interface is slick—the charts especially look great. Unfortunately, however, MiStat takes up the bulk of my 15-inch MacBook Pro’s screen. I don’t care to monitor my disk usage live, since it doesn’t change dramatically throughout the day, but the software offers no ability to disable charts you’re not interested in. Less frustrating, but still disappointing, is the MiStat’s static icon; unlike Apple’s Activity Monitor, which can itself serve as a CPU or memory chart, MiStat’s icon doesn’t update with useful data. Thus, MiStat’s good, but falls short of great. The app lacks any interactivity: You can’t toggle what’s displayed, re-sort lists, highlight specific areas of charts, or control anything else. I love having quick, visual access to this data; I just wish I could cater MiStat more to my needs.